Baby and mum asleep so modelling can be done. 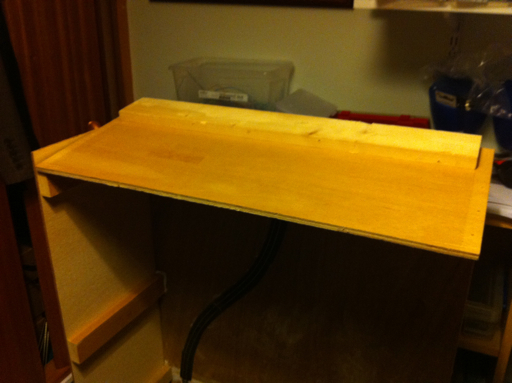 Firstly I installed the new section on the question mark board to mirror the extra foot added to the station approach. 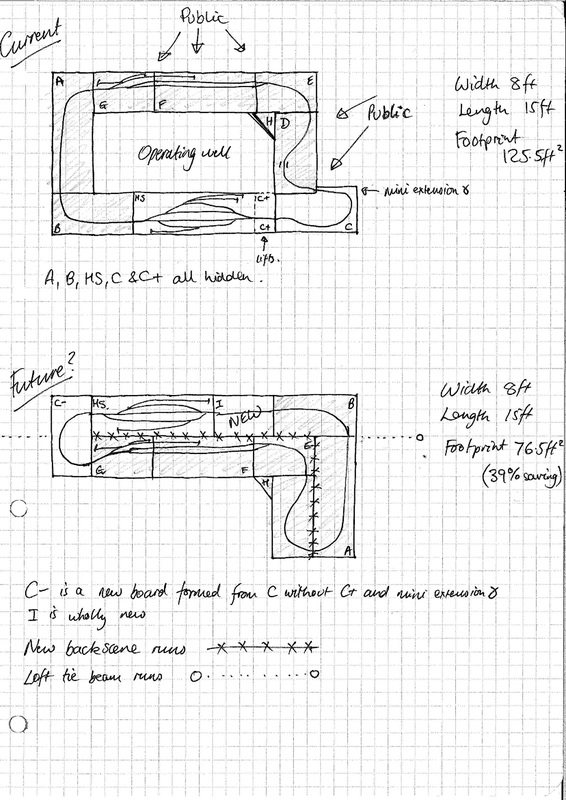 I have decided to make this hinged so that access to the layout can be attempted by thin people without requiring a duck under (with the inevitable bang of heads!). 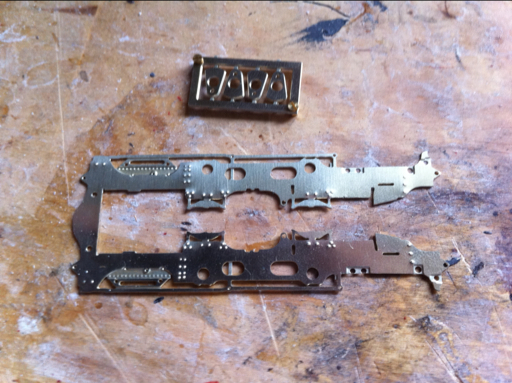 A simple mating piece was screwed onto the next board to meet this hinged section. 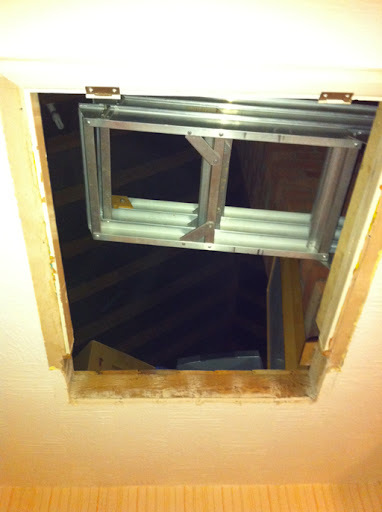 A brass bolt (or 2) will secure it in place. 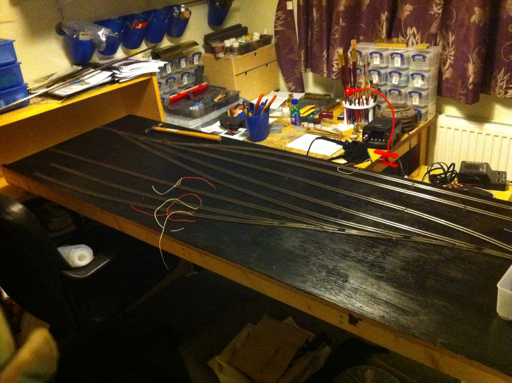 I then soldered on the roofs for carrs 24, 2043 and 102. 102 required its roof cutting from sheet brass first and also had filler dropped in to the domed end which will be shaped once dry. 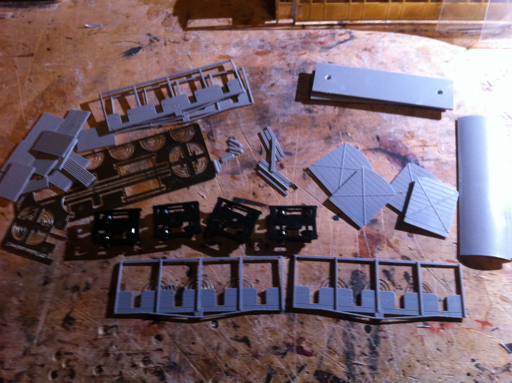 Finally I removed a few pieces from frets, cleaned them up and created a radiused fold in a loco kit - any guesses which one? - the method of attaching cranks to the axles is far superior - the plastic friction fit pieces will avoid the wheel centre melting problem! 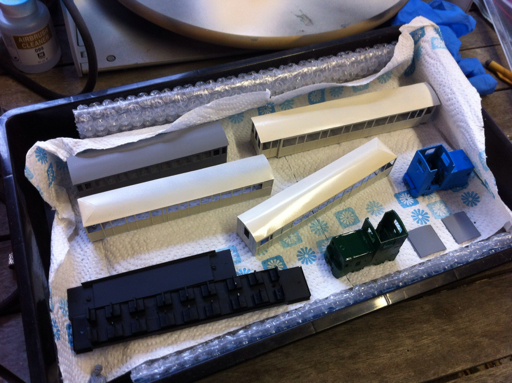 - the kit uses a live body arrangement with insulated wheels one side. 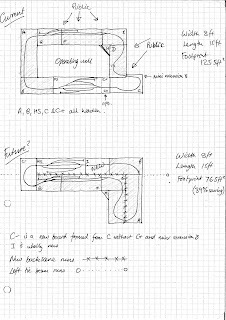 This will require some careful work to isolate the motor from the body for DCC. 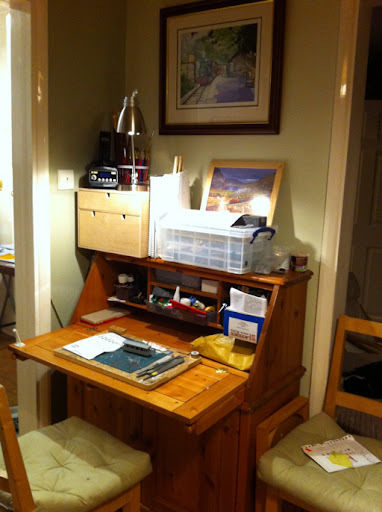 Have started by doing all the riveting (using Dad's special nails plus hammer method) and cutting out the frames. It is with regret that I announce that Rhyd Ddu will now not be able to attend the Sparsholt exhibition in April 2012. I’m part of a bid team for a st***ard gauge rail franchise which will be finalised in April 2012, and it is therefore it is going to be too difficult to exhibit Rhyd Ddu at the same time. This is a real shame as I had been really looking forward to the event but you can of course still enjoy the modern WHR in model form at Sparsholt, courtesy of our friends at Bron Hebog. - a new mek pak bottle. - and this can of paint. Now why would I need that? 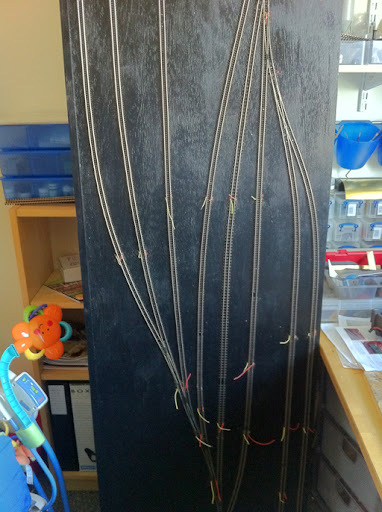 All the hidden sidings track is now nailed down and wire has been poked through ready for feeds to be soldered on this weekend. The track for the hidden sidings has been laid out, cut and joined. 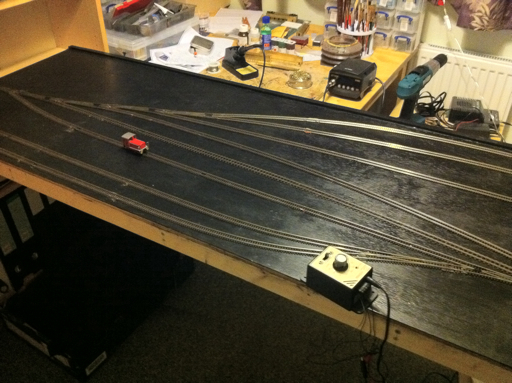 Track pins need to be added yet (it was too late to start hammering last night!). In other news the baby stuff from the loft has been brought down giving me a full loft to be able to measure ready for erecting Rhyd ddu up there. Today the first ever 009 society kit was delivered to my door. In fact two were. 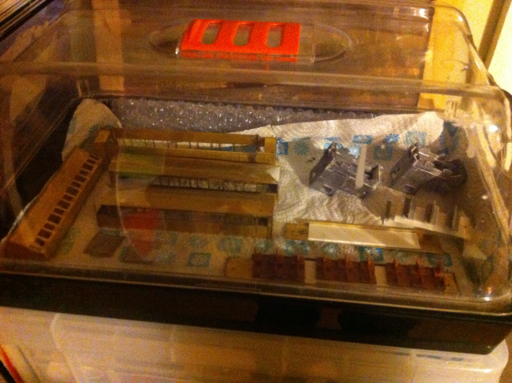 The kit is for the Hudson toast rack carriages (rainmakers). One of these runs in the WHHR heritage train in maroon and another alongside two more modern versions on the FR in dark green. Tonight I made a good start on these. All the plastic parts were cut out and cleaned up (it's a new kit so the castings were crisp) and made a start glueing on the curved side guards. Good kit so far. 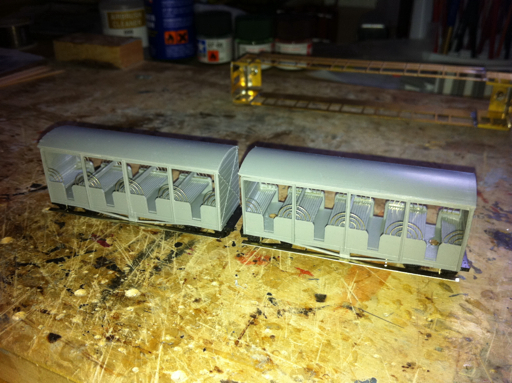 Also around my work bench at the moment are carrs 100 (which recently had it's roof added), 14, 24 and 2043. The latter two have had their roofs cut out of brass and curved recently. 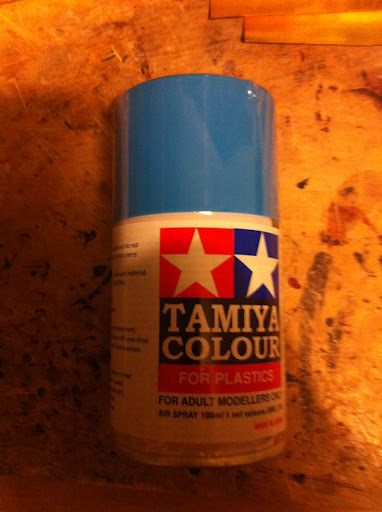 Local to our London office is a superb model shop and I invested recently in some more tamiya paints and cleaning solution for both brushes and airbrushed. 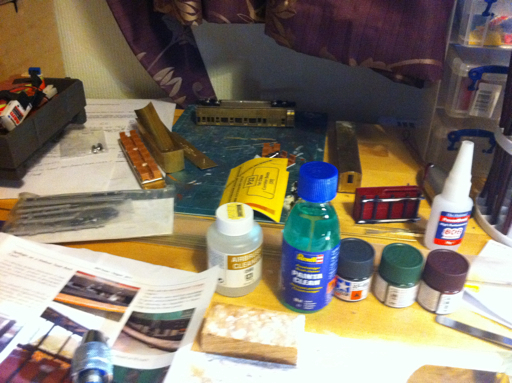 I have invested in a new soldering station. My antex was increasingly showing it’s age and will now be retired for purely electrical soldering and my cheap variable temp iron was just that, cheap and nasty so this will be filed under B for bin. The new one is provides a temp controlled iron with digital readout from 150 deg (for low melt solder) to 400 (for some serious, some might call it ‘extreme’ soldering) and 60W of power – plenty for 009! 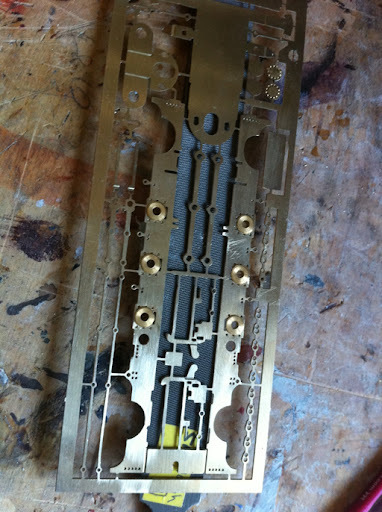 There are a myriad of bits you can buy, but for now I have a pointy detail one and a bevel bit. I may well invest in a blade style bit soon too. So far I am very happy with the build quality and it looks to be a sensible investment at about half the cost of an ersa. 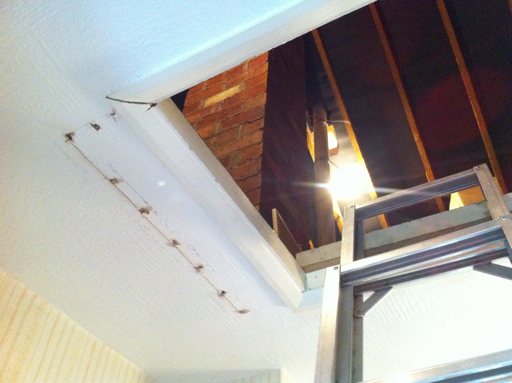 The other project is a way to avoid the damp of the garage, by moving major parts of the layout into the loft, which is boarded nicely ready. 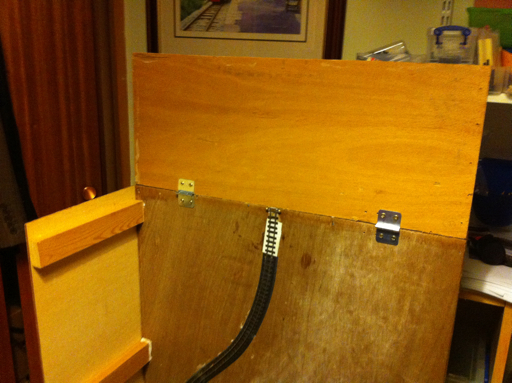 However the hatch isn’t big enough to get the 2ft wide boards up there, so I had a look tonight and discovered that widening it won’t too difficult – a weekend project I think. 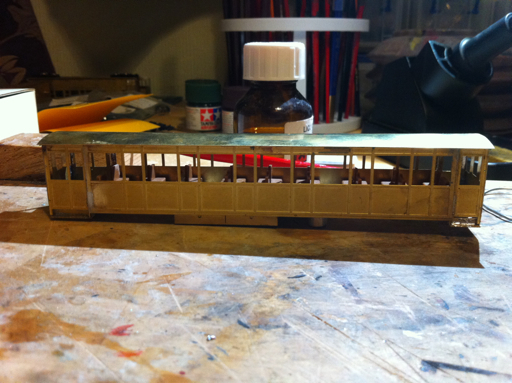 Carriage 24 is now a box with a floor, and seats installed. 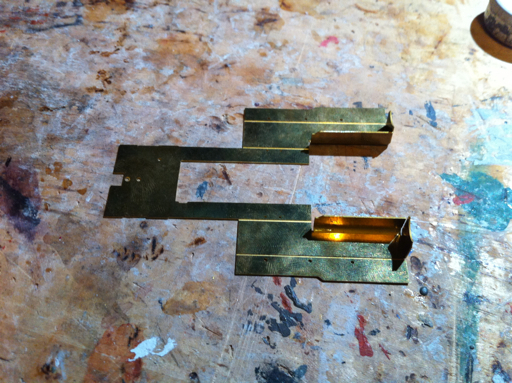 This is how I add flux and keep it square when soldering – I also sometimes use a square, but this trusty block has built all my carriages. 87 continues a pace too and nears the finish line. K1 will be attended to next, with better matched motors hopefully meaning it can move to the ‘ready for service’ section soon too. 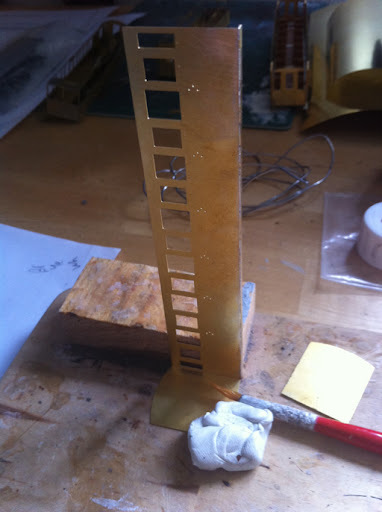 I’ve also ordered new Alan Gibson wheels for the fifth Garratt (these were loose from their plastic centres when I bought the kit half completed off ebay) and brass rod for the new water tower base construction (replacing the way too flimsy plastic previous attempt). The 5th Garratt (4th NGG16) was to be NG109 (Pete Waterman’s loco), but I may well find it hard to resist making it into NG143 in green and converting my current black NG143 to NG109 when it appears (it is expected to be outshopped in lined ‘LNWR’ black, so the conversion may not be too difficult). Should have said long ago that Rhyd Ddu is on twitter : @rhydddu and also Facebook. Work has been completely crazy recently, with very little time available for modelling, but I have found a little time to start on carriage 24. 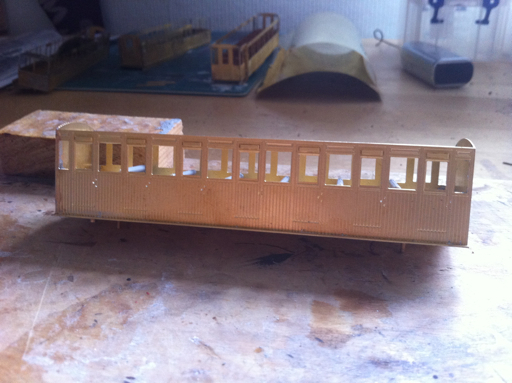 This is the replica full height summer carriage (i.e. NWNGR). 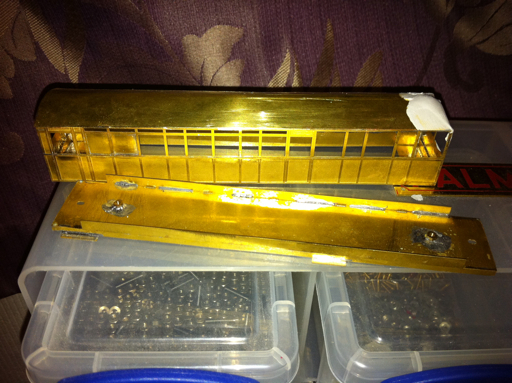 It runs as a ‘lock up’ carr at the end of most WHR rakes and so is a vital model. 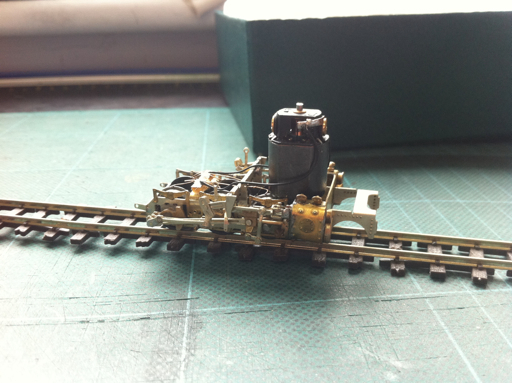 I had a kitbash version – a plastic Parkside Dundas Vale of Rheidol carriage – but it just didn’t cut the mustard next to the cut down summer carr (23). I was able to persuade Allen of worsley works to do me the etchings (he couldn’t believe there was another version of the summer carrs that he hadn’t done already). 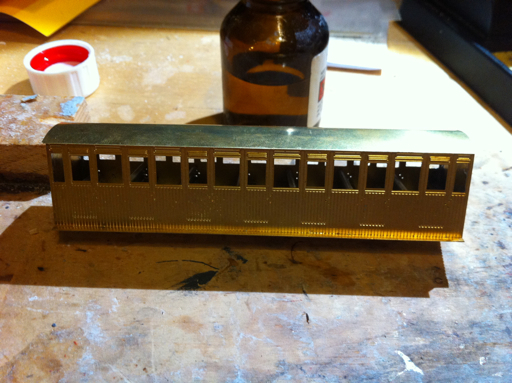 Progress so far has seen the footboards folded up and soldered in place, extra vent pieces (very small indeed) superglued above the doors (using my favoured powerbond), and the construction of a set of seats for the carriage from parkside ‘narrow gauge coach seats’. In a slight departure from normal methods, I have this time soldered bolts to the floor as the bogie pivot and will add the nut underneath (I normally do this the other way around, but on balance this may turn out to be a better way of doing it as the seats can sit over the bolt without the bolt protruding into the carriage necessitating a hole in the floor to be created. The nuts can be loctited onto the bolt and the excess snipped off. Now I just need to find time to solder the sides to the ends and the floor to the ends before I need to think about the roof (I already have some curved brass ready), truss rods etc. 24, along with the replacement 2043 and 100, 102 and 14 will be the last batch of carriages through the semi industrial process and I thus hope to have them all running for Sparsholt. The power bogies for 87 have taken a leap forward at the Cheltenham works. 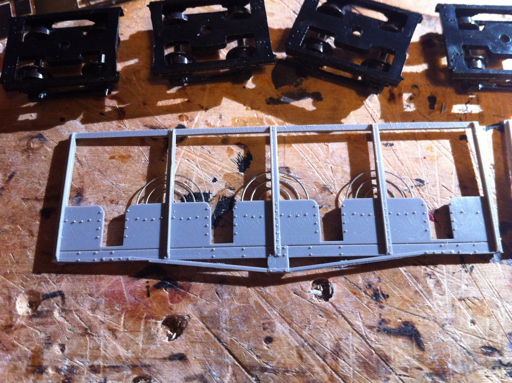 One bogie is complete and works well, it just needs painting. 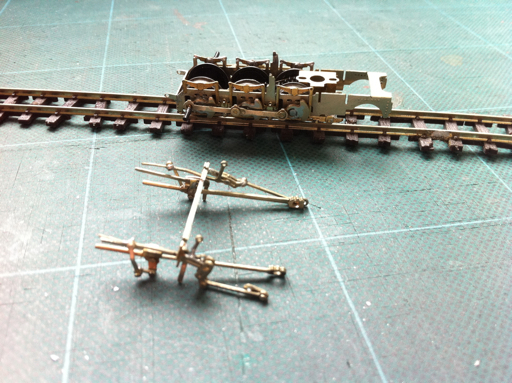 The other has been stripped back, problems solved and now just needs the valve gear reattaching. Best to paint it too though prior to reassembly, so that is the next job. The tanks and body are already 95% complete and painted with just minor details and the off White lining to complete. So we shall certainly gave black, red and blue garratts ready for Sparsholt. Calstock (Cotehele) in 7mm was nicely done and friendly – the periscope lent to Thomas was great fun. The original England loco was great too. Had a good chat with Pete at Backwoods. 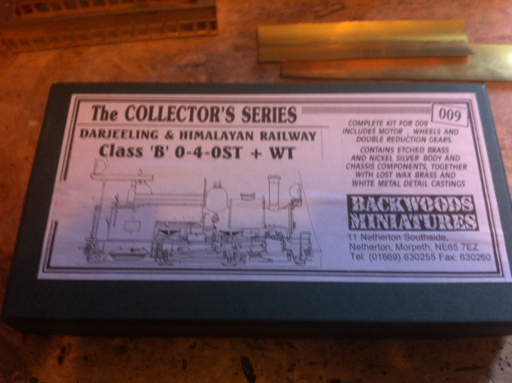 I fancy a Darjeeling B class tank sometime, but it’s clear that finding a place for a DCC chip might be a challenge – look where the motor has to go! 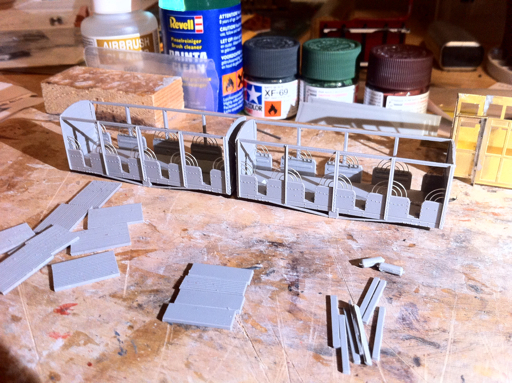 and I also picked up the etches for 24, the NWNGR replica summer carr as running on the WHR today. 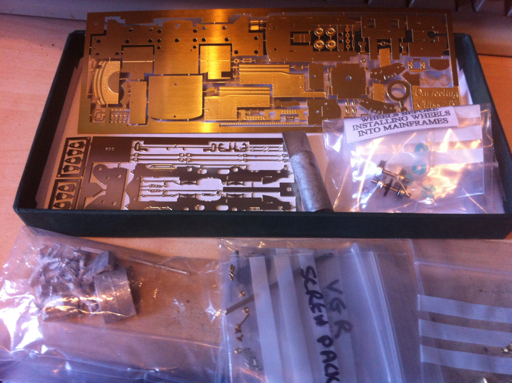 I had previously made a kit bash attempt to model this, but it didn’t stand up to the other etched kits so Allen nicely etched this for me. Today we made a trip to the Telford exhibition (report to come) and on the way back visited Prince, who having been declared “Hors de combat” currently resides at the Engine House museum, itself a part of the Severn Valley Railway setup at Highley. The main reason was to take measurements and check colours etc. for Dad’s 7mm and 16mm versions (hence the measuring tape). Whilst there we spotted a few st****rd gauge locos too!